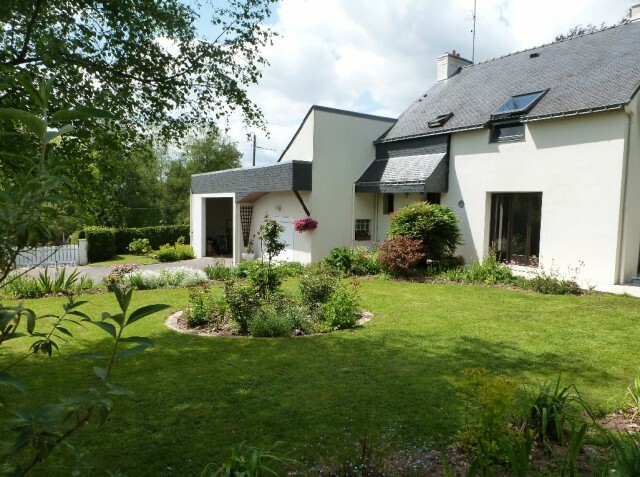 Properties for sale in Brittany, France - AHIB-2-M211095 La Chapelle-neuve 56500 Beautiful, detached traditional 3 bedroom property over 3 floors, with scope to increase the living accommodation if required or have a separate artist studio/office. The property has a gated driveway with parking for several cars, with the added bonus of having a large hanger which can easily fit a camping car/boat and a car. On entering the property, there is a small entrance hallway of which to the left has a downstairs shower room with wc and whb, and then to the right is an open plan lounge/diner which leads to the fully fitted kitchen. This is a lovely room which has 3 patio doors out to the garden and terrasse area. This living area has tiled flooring throughout. The property also has the advantage of being double glazed with shutters to all the windows, mostly manual closure of the shutter but there is an electric shutter on one of the lounge patio doors. The kitchen is fully fitted with units and cupboards, and dishwasher. From the kitchen there is a staircase down to the basement and hangar which is currently being used as an artist studio, but could easily be changed to an office/hobby room or even converted to a self contained living accommodation. There is also a reasonably sized attic space above the studio which also has the heating boiler. there is also a doorway to the hanger which is practical after parking car etc to have entry into the house. There is central heating in the property which is gas fired with radiators throughout the property in every living space. Returning back up to the kitchen, and through the lounge to the hallway is a staircase to 3 double bedrooms and a family bathroom with bath, double sink units, bidet and wc. 2 of the double bedrooms have parquet flooring and the other is carpeted, the bathroom has tiled flooring. Garden of 2385m2 which has a terrasse, trees, shrubs, flowers, large parking area and a wooden summer house and a large garden shed. The terrasse area has an awning from the wall, which can be used for shade when eating outside.